Joseph Gordon-Levitt has proved once again why he is one of the best actors in the business today. 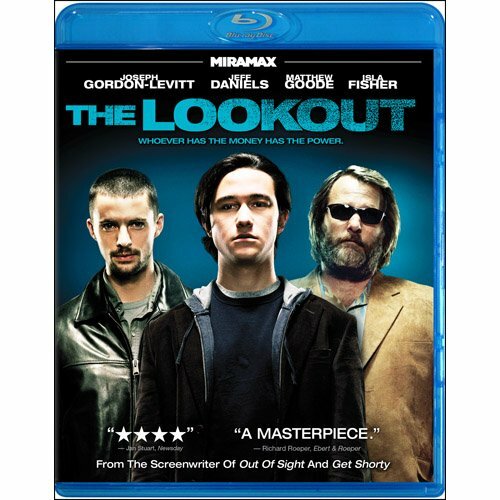 This film, ‘The Lookout’ has an all-star amazing cast, a great plot and character development, and flows nicely. With a cast of Joseph Gordon-Levitt, Jeff Daniels, Isla Fisher, and Matthew Goode , you can only expect the best. And all of them brought their A game to this “missed by most” gem of a film. I highly recommend getting this movie and would be great in any movie collection. I was first introduced to Chris Pratt (Joseph Gordon-Levitt) who is a student who gets in a tragic and violent car crash that kills a couple of his friends and leaves him with virtually almost no short-term memory. Cut to four years later and we see Chris trying to live a simple routine daily life, but having trouble even doing that. His abode is riddled with notes everywhere that tell him not to forget the simplest of tasks and routines. And his daily events are written out to the finest detail. 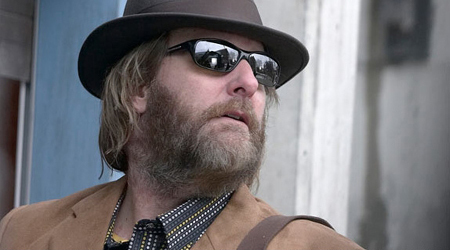 Chris has taken a job at a bank as a night janitor and befriends a man named Lewis (Jeff Daniels) who is blind. His other friend is Ted who is a police officer. Lewis is the heart and soul of this movie. He always looks out for Pratt being his conscience. Every time Daniels is on screen, the screen is a little bit brighter. Now Chris runs into an old friend from school named Gary (Matthew Goode) who befriends Pratt and introduces him to several friends including Isla Fisher. They all take a liking to Pratt, but for the only reason being they want to rob the bank Pratt works at, and they figure they can convince him to help them out. From here on out Pratt is tested of who he was, and who he has come to be in his friends, loyalty, and his morality. It really is a moving film to see people with disabilities stick together and look out for one another. I loved seeing that portrayed on film and it was done beautifully. I thought the script needed a little work here and there, but overall, this is a solid film. I really liked it and I think you will too. Presented in 1080p with the AVC MPEG-4 codec, ‘The Lookout’ is a vibrant and beautiful film to look at. There is somewhat a layer of grain, but in no way does it lessen the depth of the film. The colors pop out with its darker tones and the flesh color is just amazing. The cinematography is brilliant on this film and it shows with this transfer. As far as the audio goes, ‘The Lookout’ has an uncompressed PCM 5.1 surround track (48 kHz/24-bit/6.9 Mbps) and also a Dolby Digital 5.1 mix(640 kbps). The sound engineers really out did themselves with the dialogue here. You can clearly tell when the actors are speaking in a large public space or in the confines of a small apartment room. This is more of a dialogue driven film, so the full on speaker sound isn’t really all there except for a few moments here and there. But the dialogue is crystal clear and when the action punches through the speakers, it sounds big and full. – Audio Commentary Track – The commentary track is with writer/director Scott Frank and director of photography Alar Kivilo. It is mostly interesting and fun to listen to for the first half of the film, because they give some insight on the film’s production and story, but then it turns into a boring technical and self praise type of commentary. I’d rather have heard more stories. But for fans of the film, it is a good listen. – Behind the Mind of Chris Pratt – A short nine minute series of interviews from cast and crew on the character Chris Pratt. Fairly decent extra on how the cast and crew perceived the title character, but got repetitive. – Sequencing ‘The Lookout’ – This longer twenty minute featurette is more of your basic behind the scenes segment with interviews, production, casting, and filming. Just your average making of. I enjoyed ‘The Lookout’. It is an original and different film from the norm which is a good thing. The performances from the actors are top notch and you really develop a relationship with the characters. Especially with Pratt and Lewis. The audio/visual is not demo worthy really, but it is right under that level. But isn’t that type of film. The uncompressed sound is amazing. I wish there were more extras on this film. Pretty slim pickens as far as the extras go, but overall, the film is definitely good and worth getting. Purchase ‘The Lookout’ directly from Echo Bridge HERE!!! This entry was posted on Sunday, August 21st, 2011 at 1:58 am	and is filed under Film, News. You can follow any responses to this entry through the RSS 2.0 feed. You can skip to the end and leave a response. Pinging is currently not allowed. Yes it was definitely good. « The Hit 1983 ‘War Games’ To Be Remade!! !